What's "PMDG classic" plan after the DC-6 ? 747-200, L-1011-1, DC-10 ? It would be amazing if PMDG will work on those type of aircraft. 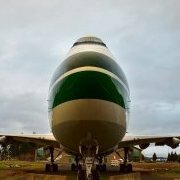 PMDG is not doing a DC9 that we know about. I think, if they're going to do classics at all, they'll probably be Light versions, just like the JS4100. The DC-6 is a classic for sure. I hope it sells well and PMDG is encouraged to do more vintage types. DC-6 perhaps? I'm pretty sure that's underway. One might consider that a classic. I hope it sells well and PMDG is encouraged to do more vintage types. Me to. There doesn't appear to be much love towards the classics, hoping the DC-6 will change peoples views towards the old birds! 747 classics, eventually with FMC upgrade would be the best thing ever. Next to the 777-300 ofcourse! Yes i agree, and the choice of 747 combi or not. The 747SP in expansion pack :blush:. Isn't the dc-6 a 'fill in' for between major builds? PMDG have said a number of times that they really only build airplanes that are currently in service at most major airports. I can see them doing some sort of airbus. Surely with all the people wanting them too, it would be silly not to make one. They would sell so many it wouldn't be funny. Or they could be doing the 787... who knows. My bet (and hope!) would be a full set of 747's in the 747 v2. I'm talking 747-400, 747SP (Still in service with IranAir, so it counts as an aircraft in use), 747-800 and then 747-100/200 (all 3 as expansion packs). They could even work with QualityWings for the 747-8, I've noticed some praise going between the two developers; someone from PMDG has been quoted before saying that PMDG wouldn't make a 757 anymore cause QW brought out a decent enough model. Add the fact that QW is working on a 787 to that, and they could perhaps do a collaboration to speed things up on the 747-800. I don't think PMDG will do Airbus though, they're a Boeing licensed simulator developer (which is also why they never will be able to officially support Lockheed-Martin's Prepar3D), so doing an Airbus would be near impossible. The only things they could really still do with Boeing is a reworked 747 (the 747v2), a 767 and a 717. The existing 707, 727, 737, 757 and upcoming 777 and 787's are decent enough for PMDG to look elsewhere. Come to think of it, I'd like to see a realistic 717 too. Maddog may be, no, IS the most realistic MD-80 out there, but it's starting to show its age as well on some points. As Ryan said before: Stop assuming that PMDG can't make anything else than Boeing planes, just because they have some connections there. If they wanted to do an Airbus, and saw market potential for one, I bet they'd be all over it. Also, the 747SP doesn't really count as "in use at most major airports", now does it? I'd hate to make assumptions, but although I could understand that the... harmonious relationship with Boeing doesn't prevent them from making planes like the MD-11, or the DC-6 or even a Lockheed Constellation, I think even Boeing would be mildly preturbed if PMDG would forfeit their relationship to go and make Airbus planes, the main (and only big) rival they have on the commercial market at the moment. There has been market potential for Airbuses for a long time now, yet PMDG hasn't even begun to touch on it. And no, the 747SP isn't "in use at most major airports", but that's not what I said either. My point is that it's still in use, not that it's in all major airports in the world, thus making it more susceptible to being the first expansion pack for the 747v2 after the 747-8. Even if the DC-6 is a 'fill-in' project, I would assume there will be more fill in projects in the future too. DC-3s, Convair twin series, Beech 18, Electra...etc btw those are all still in service too. The 747-400 PMDG is making, and the 747 SP (a derivation from the classics) are entirely different beasts. If anything, they won't make it as an expansion pack, but as an entirely new plane. It just isn't an expansion to the planes they currently have lined up. A Boeing 717 would be excellent from PMDG but this has been so far confirmed by PMDG as not a possibility with them, shame as living in Western Australia I have flown and seen these aircraft with QantasLink and it would be really good to be able to fly them in the simulator. But you never know PMDG may change their minds in the future. I am following the TFDi design version at the moment, I wonder how that will turn out? If only the 777 was a fill-in between the Classics! My dream would be a VC10! The 747-4 and 747-8 are different beasts too, yet the 747-8 was given as a "cosmetic" expansion to the 747-4 v1. No one knows how PMDG is going to define their 747v2 pack ultimately; they could keep it at just the 747-4 or add the 747-8i (as per the latest news on the subject) or even go all out, take 10 years to develop this and then come out with a 747 Megapack. Heck, they could even do the 747-4 as base and then have a "Classic 747" expansion pack with all the classics. Unless you are 100% certain it's not an expansion and you can verify your sources, your guess is as good as anyone's. As far as Airbus is concerned, we're all still waiting for the first decent Airbus (for FSX/P3D). Testament to this is the fact that everyone is still scrambling the moment Aerosoft releases an update to the AXE, BBS is managing to make a lot of people pay for a "prologue" of an Airbus while promising their purchase will help perfect the plane along the line and people are even still waiting -on a 7 year old simulator- for FSLabs to make a decent A320 based on how excellent their Concorde proved to be. They could go for something else, sure; but I remain confident it'll either be something historical then (DC-6), something comparatively niche (MD-11, JS4100) or something that hasn't been done yet. There are already versions of all 4 things you mentioned that range from "on PMDG's level" (Majestic's Q400, minus the joyful bouncing around) to "decent enough for most simmers" (Wilco's E-Jets/ERJ's) or "on the way and very promising" (DigitalAviation -or so I think- their rendition of the CRJ series). It's no truth, but it's an educated assumption. Hopefully well! Can't wait for a good 717. I disagree, the 748 is a logical evolution, coming from the 744. Some features have been adopted from the 788 development, but not really that much. A lot of the systems logic is kept pretty much the same. It's just "the next step forward" in comparison to the 744. The reason they included the -8 as a visual model only was, if I remember correctly: Lots of demand, but not that much known info about it. Now that the 748 is well established on the line, they can do a full model. I was only giving examples as to what they could be doing, not what they should be doing after this. I'm pretty sure they have a decent roadmap set out. The 747-8i is the new overhaul of the 744, and could thusly be seen as the "modern age revolution" what with the new partial fly-by-wire technology, reworked wing design, and other implemented advances of this day and age. In any case, this is all guesswork. PMDG is the only one that knows PMDG's road map and the only one that can decide/reveal changes to it. You and I can keep going back and forth about this until we're both more than fed up, but it won't change the fact we'd be making educated assumptions. I've said what I wanted to say with regards to the original poster's question (my hope is for a "classic 747" series), and I'm going to leave it at this. Don't get me wrong, I'd love a 747 Classic series too, but I don't see PMDG doing one, sadly. It would be an ideal chance for me to do some old Long Range Sabena routes. But you have to agree, the -8i is far less of a revolution than the 744 was. Things like FBW don't matter much in FSX, it's all FBW anyway. Also, if I remember this correctly, the 748 is rigged to "feel" like a 744, to make conversion easier. The main change, FSX wise, would be the engine performance modeling I think. I heard that they brought Milviz on for the VC moddeling, so I can assume it will be pretty awesome! for FSLabs to make a decent A320 based on how excellent their Concorde proved to be. A 747 classic with a bit of digital upgrade in it would be fantastic!